English merchant, musician, and communal worker; born in London Aug. 23, 1827; died there Dec. 30, 1875; younger son of Solomon Jacob Levy. He studied at University College, London, but left without taking a degree. At the age of seventeen he wrote a series of articles for the "Times" on the question of international traffic, and in 1858 he contributed to the "Daily News" a series of letters on "A Tour in Auvergne," afterward included in Murray's "Handbook to France." Waley entered the stock exchange and acquired an influential position, being elected a member of its committee. For nearly a quarter of a century he was honorary secretary of the Jews' Free School, and conducted the entire correspondence between the school and the government Board of Education. From 1843 he was the official correspondent for England of the chamber of commerce of Boulogne, in which city he took great interest. 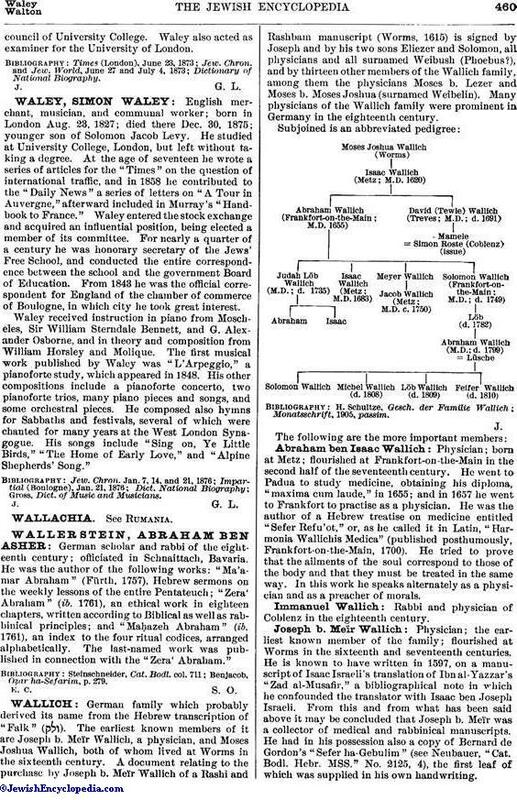 Waley received instruction in piano from Moscheles, Sir William Sterndale Bennett, and G. Alexander Osborne, and in theory and composition from William Horsley and Molique. The first musical work published by Waley was "L'Arpeggio," a pianoforte study, which appeared in 1848. His other compositions include a pianoforte concerto, two pianoforte trios, many piano pieces and songs, and some orchestral pieces. He composed also hymns for Sabbaths and festivals, several of which were chanted for many years at the West London Synagogue. His songs include "Sing on, Ye Little Birds," "The Home of Early Love," and "Alpine Shepherds' Song." Gross, Dict. of Music and Musicians.